Karnataka has Bangalore which is a metropolitan city as its capital. 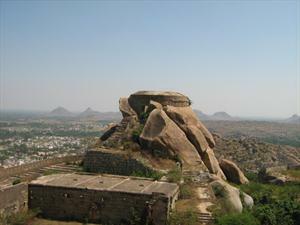 Madhugiri is one of the most famous tourist attractions in Karnataka. From Karnataka's capital city Bangalore, Madhugiri is only 102 km away and it is one among the nearest tourist spots around Bangalore. Madhugiri is the Head Quarter of Tumkur Thaluk Region. As the meaning of the place name Madhu - Giri says, it is a hill. Giri means a hill and this Madhugiri is Asia's second largest hill with a height of 3930 feet. There is a Fort at midst of this steep slope which was once tribute to Hyder Ali in ancient days. There are three gateways for this fort namely Antaralada Bagilu, Diddibagilu, and Mysore Gate. A sequence of entrance gates lead to the hummock. To the top of this hummock is a temple for Lord Gopalakrishna. This temple is almost ruined and only the remaining of the temple building is kept in the remembrance of the ethnic temple. Madhugiri being a hill is not a well populated area and so it is hard to find shops for food and etc. If you are planning for a tour to this place Madhugiri, not to have the problem for eating, it is always advisable to have food and lots of water along with you as you travel by. 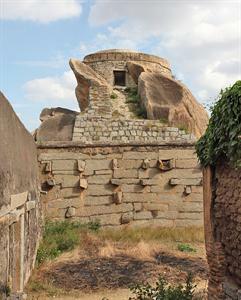 Madhugiri is locally called as Madhagiri by the people of Tumkur city. It is situated at a distance of about 43 km from the Tumkur city. Madhagiri has both a hill and a valley which are well-known along with valley having a Fort amidst of it. There are various hills in the world. But only few of them are said to be monolith as it has the sculptures carved on them. 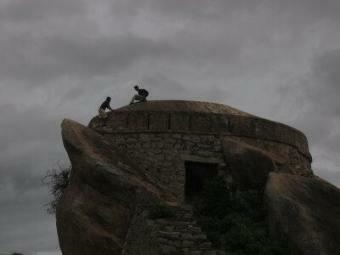 In that way, Madhugiri is the second largest monolith of Asia as this hill also has sculptures carved on it. It forms the major appeal for the touristers to see this hill with the monolithic sculptures carved on it along with the greeneries around the hill. In addition to the Gopalakrishna temple on top of the hill there are two other early temples in this hill for Venkataramanaswami and Malleshwara. These temples were built in Dravidian fashion of architect by the Vijayanagara emperor.